The 23-year-old aspiring music teacher Yu Wenxia said when asked why she should be crowned: "When I was young I felt very lucky because so many people helped me, and I hope in the future I can help more children to feel lucky". First and second runner-up are respectively Sophie Moulds from Wales and Jessica Kahawaty from Australia. 1. Newly crowned Miss World 2012 Yu Wenxia from China waves to the crowd at the finals of the Miss World pageant in the Dongsheng Stadium in Ordos, Inner Mongolia, China. 2. - 4. 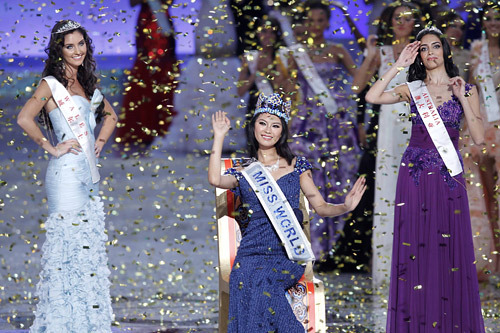 Newly crowned Miss World 2012 Yu Wenxia (C) from China, first runner-up Sophie Elizabeth Mould (L) from Wales and second runner-up Jessica Michelle Kahawaty (R) from Australia. 5. The final of Miss World 2012.